32 pages; Dimensions 8.72 x 9.86 in. A self-assured slug slinks slowly up a suspicious sloping surface. Scoffing at shouts of "Stop!" 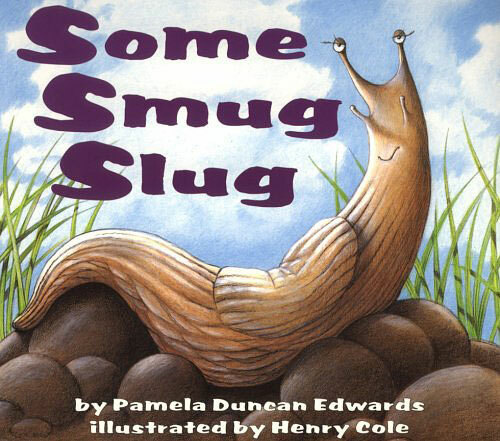 from spectators, the smug slug finally reaches the summit. Is he in for a shocking surprise? 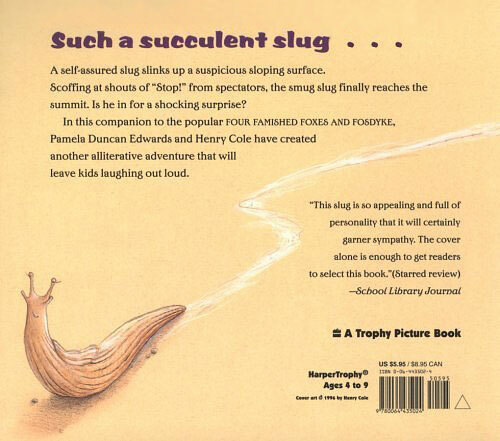 This slug is so appealing and full of personality that it will certainly garner sympathy. The cover alone is enough to get readers to select this book.  Select a page, such as page 27, on which to insert another appropriate word beginning with "s". Pamela Duncan Edwards is the author of numerous popular picture books. She taught preschool for eleven years in England before becoming a children's librarian when she moved to the United States. She lives in Virginia with her husband and two sons. Henry Cole grew up on a farm in Virginia and loves farm animals, and little red barns, and the first snowfall, and the first warm spring rain. He has worked with a number of celebrity authors to create children's books, including Julie Andrews and Harvey Fierstein, and is a longtime supporter of RIF.